“Finally,” Laura said, giving me a big hug. She sat down at the table where I had been waiting for the last half an hour. Bordering the old town, Festival 33 was a café with a belle epoque air, in a historic building that served as an inn – Hanu’ lui Manuc – in the early days of the city. “What happened?” I said, trying to sound as if nothing actually happened. She made a sign to the waiter, who in return made a sign to her. “Oh, well, you know how it is,” she said. “I was about to leave the office when you called, then something came up at the last moment. An email from a client. So much work to do, you, Andra!” Laura’s way of speaking had always made me smile. Even when I was mad at her – for example, for being late, like today – I still could not hold it against her. She would have never accepted to be upset with her in the first place. “You missed Bucharest, right?” she said, looking at me. Laura was so proud of our capital city, she would have never let me say anything bad about it. She had only been living there for a few years. Before that, she lived in Cluj, a beautiful, yet smaller city in Transylvania. When her mother moved to the capital for work, Laura followed her. “Mno, I always loved coming back home from the US,” she said. As a student, Laura used to spend her summers in the United States, working and travelling. I had never travelled anywhere farther than Europe. The waiter shows up, ready to take the order. “What would you like to drink, miss?” he says to Laura. I still had my lemonade, which I had ordered before. Laura takes the menu from the table and opens it for the first time. She is pondering on the selection of drinks. “Uhm… A cappuccino? Or maybe an espresso?” The waiter was waiting. “I’m quite hungry as well,” she said. “Do we eat?” She looked at me. “I promised mother I’d eat at home. But get something if you’re hungry.” The waiter was waiting for the conclusion. “Mno, I’m not eating alone,” she said. “You know what? Why don’t we have a beer instead?” I was still happy with my lemonade, but we really needed to say something to the waiter. I could tell he was not happy with us holding him there for so long. Couldn’t we have decided already? He was busy. “Two Stella, please!” I said to the waiter. I knew she liked that beer. “Let’s try something different,” she said. “We always have Stella.” The waiter moved his weight from one foot to the other. “What beers do you have?” Laura asked him. “I know they’re on the menu. I was hoping you would recommend us something.” I wish I could evaporate from the scene. I was almost sympathising with the waiter. Yet choices were important to Laura. She would take her time to make the right choice. The guy started to mumble something, but that was too late already. Laura had made up her mind. “I think I’m having a headache.” She rested her head in one hand. “Just bring me a cappuccino.” She dropped the menu on the table and looked at me. The waiter looked at me, too. “I am fine,” I said, taking a sip from my lemonade. The waiter disappeared. “Did you see that?” Laura rolled her eyes. “Maybe he doesn’t like beer,” I said, trying to make light of it. It worked. I then told her about the trip to Amsterdam, how I met Dragoș again – the two of them had never met in real life, but were both much aware of each other from my stories – and I mentioned Alex. Laura listened carefully. She asked no questions. We decided to go for a little walk, before heading back home. The cobblestone streets in the old centre were our favourite place to walk. 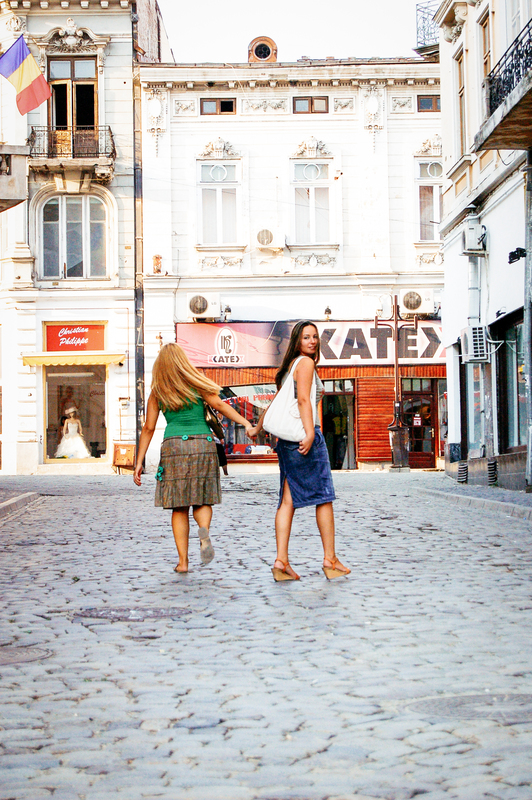 “Did you know Strada Franceză is the oldest street in Bucharest?” she said as we walked along that street. Just like in her words and gestures, there was conviction in her moves, as well. I could feel this each time she grabbed my arm when walking next to me. The more passionate she was about something she said, the more energetic the shake in my arm. “Mhm,” I said, hiding a sigh. The history of my hometown had never been one of my interests. “You, Andra, just look at these buildings! Aren’t they amazing?” I turned my head and looked. I had to, she was pointing right at them. With few exceptions, all I could see were dilapidated old houses, with broken windows, and crumbling façades. As we were staring, a boy came out of one of the buildings. “Miss,” the boy says, reaching out an open hand. He is barefoot and wears just a pair of shorts. “Such architectural mix!” Laura went on as if nothing happened. I looked at the buildings once more, then rushed my steps. The boy was walking behind us. Annoyed he was not getting any money, he started cursing instead. Quite a rich vocabulary for his young age. “Maybe we should leave,” I said. “Oh, you, Andra!” Laura stopped in the middle of the street. He is just a boy. Stop being so frightened! I knew that was not all. I was waiting for her to say the magical words. “It’s just the Balkan spirit!” There they were! The words Laura would say anytime something bothered me about Bucharest. This is how she would shut my mouth up, time and time again. What could possibly be wrong with a young, gipsy boy, almost wearing no clothes, following us and cursing us in the very centre of the city? There was nothing wrong, it was just the Balkan spirit. The boy seemed to have got bored of us in the meantime. He was after other people. “Everything alright with Andrei?” Laura said as we resumed walking. I realised I had barely mentioned Andrei that night. “You, Andra! How come you never take me to Malu?” She shook my arm, then stopped and looked into my face. “Would you like to join us?” I said. “Of course! I want to go to Malu, I want to go to see your grandmother in Teleorman, and I want to go to the Danube Delta with you.” I had been telling her a lot about these places, each of them meaning so much to me, yet I had never taken her to see any of them. Although I knew she would have loved to. Laura was not only a friend to go for coffee and shopping. She had this genuine interest in knowing me, my family, and understanding where I was coming from. “Come with us this weekend then!” I said. We were waiting for the bus at Unirii. “Here’s 104, get ready!” Buses were full most of the times, so preparation was needed to make sure you get inside. “Can’t we just walk?” Laura said the same way a child would ask from the backseat of the car, bored and on the verge of losing patience, if they arrived at the destination already. “You know I hate coaches!” she continued. “Buses, you mean.” Funny how buses and coaches, just like shoes and slippers, meant the same thing for Laura. When it came about using public transportation in Bucharest, she would either walk or take a taxi. “I almost forgot I brought you something from Amsterdam,” I said, while on the bus. Laura’s eyes got bigger, like those of a little girl who had just bumped into Santa on Christmas Eve. “A present for Lăurici? What can it be, what can it be?” She could be quite loud when excited. The people around seemed just as curious. In her enjoyment, she lost grip of my arm and almost hit herself by the door when the driver made a turn. Laura would never hold the rail. I reached for my bag and got out a little metal box, decorated with tulips, windmills and wooden clogs, all white and blue. Laura took the box and attempted to open it. She lost her balance once again when the bus stopped. “You’d better open it at home,” I said. “You need to get off now.” Although there was just one bus stop for her, somehow she would always forget she had to get off. She jumped off and waved at me happily, agitating the box. I was sure she would like the present. I brought her sand and shells from the North Sea, which I had picked myself from the beach at Scheveningen.